I totally wanted to do a video about my YAllfest experience, but (as usual) I was having so much fun I forgot to film. 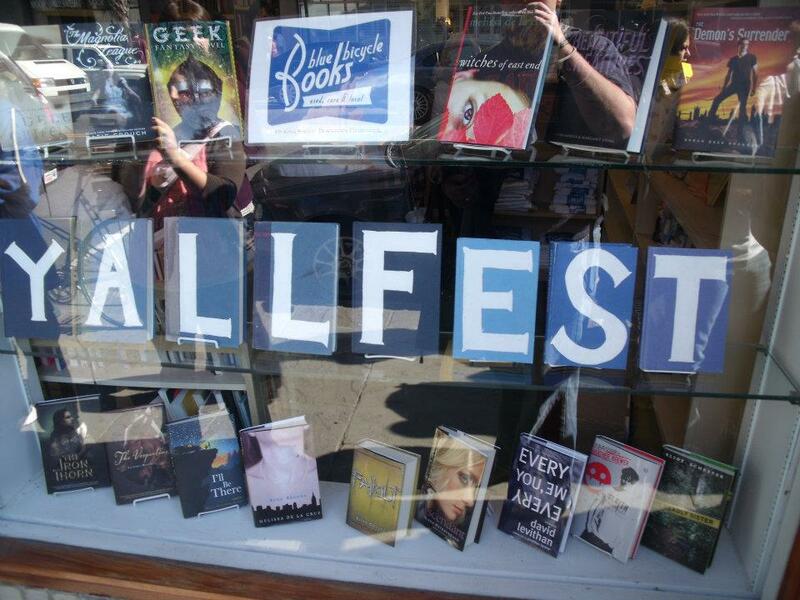 So, for you, here are my top five YAllfest moments. 5. Seeing my old friend Kaleb Nation again. I’ve known Kaleb for about four years, he tried to coax my firstborn into the world, and we even share an agent now… but this is only the second time I’ve seen him in real life. There was a camera crew following him around as Kaleb has mysteriously acquired his own reality TV show! And now that I know the premise (which I will not spill yet, just in case) I am SO IN LOVE WITH IT! Anyway, Kaleb is my homie, and it was nice to see him. 4. The authors. They really had a great collection of people there, and it was so fun to listen to (and meet!) so many of the authors I admire. For the record, Beth Revis (Across the Universe) is such an enthusiastic little darling face. Seriously. I think if I could be reincarnated, I’d come back as a cat and pray she adopted me. I have a feeling even a cat in her life would feel adored. Just saying. 3. Hanging with friends, both old and new. I drove down to Charleston with my friend Mary who was a junior bridesmaid in my wedding. I can’t believe this girl is all grown up now! But there were also people I only know through twitter or other creepy online things. Because we all know I’m creepy. Anyway, all I’m saying is, it was great to be in such good company. 2. Mark Morgan (the producer of the Twilight movies) was there to do a panel about book adaptations. However, his little clear plastic nametag holder was empty. I offered to fashion him a nametag from a borrowed pen and a flowery piece of paper from my notebook, and he not only accepted, but wore it for the rest of the day. In general, I like being helpful, but it was also just plain cool. 1. I got recognized! This sweet girl named Michelle knew me from my videos and came up to me, hugged me, asked me to sign her notebook, and took a picture with me. Things like this totally shock me because I don’t expect it! And I’m always happy to meet anyone who enjoys my books/videos/tweets/smell or whatever that it just MAKES MY WHOLE DAY when it happens. Let Michelle be a lesson to all of you! If you see me about anywhere, stop me, hug me, and talk to me because I genuinely want to meet you! I think, especially for a first year, the festival went really well! It's got so much room to grow, and I hope I get to go again next year!